A Lovely Lark: FikleChik Freebie! Love your blog. I've learned so much. My favorite is #7. I love #9 under Natural and Neutral. Hey Lauren. Love the idea of offering up one of Mike's bags. I'm a fan of #8.
oh yeah i became a follower. Hope you are having fun down under. number 9 is pretty hot also. lol. so hard to pick just one. AND i blogged about it on my blog and am going to try and link it to facebook also. i'm crossing my fingers on that one. oh my... what lovely bags!!!! i am especially in love with neutral #9. so lovely!!! I love #2 and #5, and I became a follower! Ohh, love this idea! The bags are all fabulous! Love, love, love the fun and funky ones, but if I had to pick just one to be my favorite, it would be #9. I'm a sucker for a big purse! Such a tough decision as they are all so creative and inspiring! My choice is Number 4!! I love your work Michael. Thanks Lauren for introducing me to his line! I just became a follower. Your blog is fun! I'm not a bag person normally, but these are great. But in a showdown between #4 and #8, I'm going with 4. Very cute! They're all so cute! I love the color of #2, but #9 is probably my favorite just because it's more practical for me. How creative! These bags are so different and neat looking. 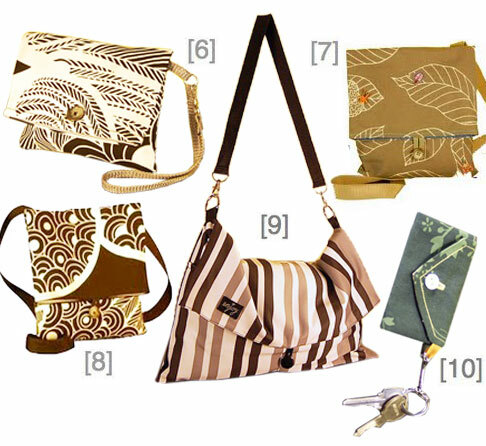 I love the design and color of bag #8. I love #9 from the second set. Lovely! Enter me! =) And I'm already a follower! Thanks- Those bages are great! #8 is my absolute favorite! I love the style of the bag, where you can be comfortable just wearing the bag over your shoulder, and you don't have to keep fidgeting with the strap and worrying that you're going to lose your bag! Not many companies/places make bags with long shoulder straps anymore! The pattern is pretty too! And I'm following you! Yahoo! 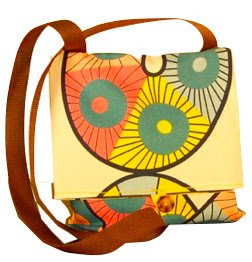 #2 is adorable, love the colors and the design. Great giveaway! And I just blogged about your awesome giveaway too! Yay! More chances! Keeping my fingers crossed! I love #8! Your friend is very talented! Oops forgot to mention I am a follower- # 8 is still the one! hi, found you thru evangaline's vine, oh please enter me, come over and enter my giveaway, nice to meet you. great bags! 1 or 6, ok, let's say 6. I'm a follower! my favorite is number 7. I love, love, love the Super stripes fold over shoulder bag. Thanks for having such a fantastic giveaway!!! #8 - Love the colors and pattern! They are all so cool, but I'd say #6 or #9 would be my picks. I love, love, love #2!!! That color is great! Oooh, my fav is #3 - quirky! I love how the internet makes the world a small place - bumping into old friends in unexpected online places! Lauren, I love your blog, especially when you post idea boards. Cute bags! I like #7 and #9 the best. I'm now "officially" a follower, but I've followed you on google reader for awhile. Boy -- it's hard to choose -- but I think #8 is my favorite -- love the shape and colors!! I am now a follower, too!! Hello! I'm a friend of Michael's dad and he told me about this contest. These purses are awesome! I love #9 but I think #4 is really cute and funky so I would have to say that is my favorite. 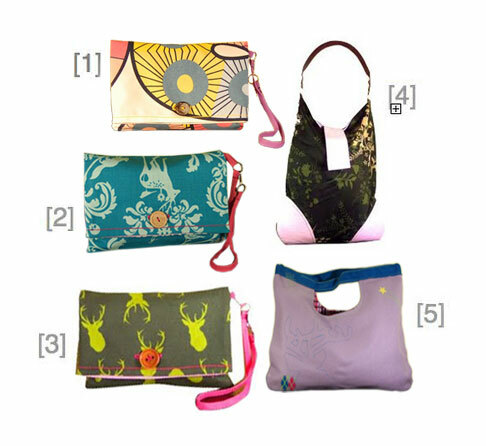 What girl wouldn't love one of these fabulous purses!! I love the colour of bag #2! New to blogging, but I figured out how to follow you! I like number 7. Mike is an extremely talented guy! I love the neutral stripes of #9. Great shape and so versatile. This contest is now officially closed. Thank you to everyone for your wonderful comments and participation and to Mike for your fabulous purses! Good luck to all!